Tell them that not only are you going to continue using it, but that you're getting a wider sidecar so you can take up more space. What kind of stupid question was that anyways? 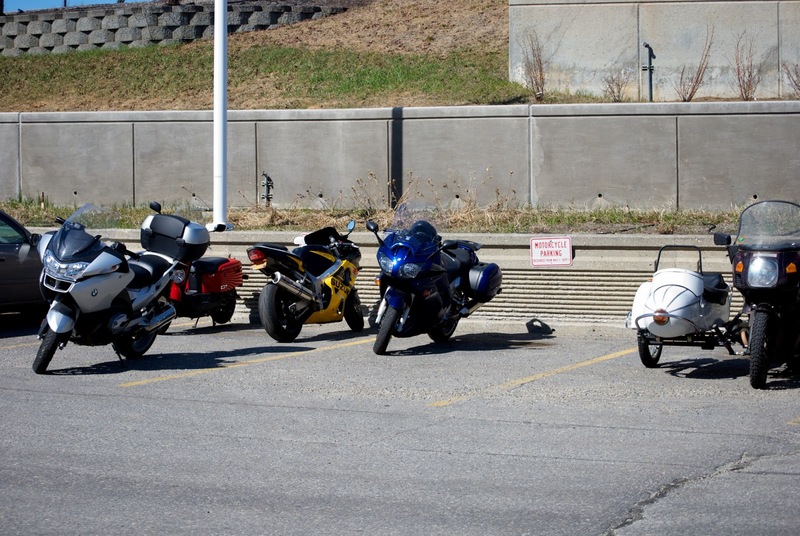 This summer, construction in the parking lot will reduce the number of motorcycle only spots from 3 to 2. I told them that if it's a nice day, I'll just take the adjacent spot since I'm usually in earl enough to easily find parking. If it's raining, I'll just use the motorcycle spot since most of the other riders would opt to drive anyway. It's kind of nice to have a choice. I think there was some concern as the number of motorcycle spaces is bing reduced for the summer since they are tearing up the parking lot to fix the retaining wall. I am thinking you are riding the true cross over sport vehicle. I agree with Martha take up any space you want and smile. That's what I plan to do when we get some decent weather. In the past, there have been as many as 12 bikes in those three spaces. My eyes are watering just thinking of the smoke. Did find you coughed a bit too? You are still on a motorcycle and can park in motorcycle parking -and they should be grateful you aren't parking cross ways on them. Nice to hear you are getting some warm temps. If anyone deserves it you do. Our rain came back about a week ago and we are socked in for the long haul. We'll get up to 50˚ today if we are lucky. Even had to turn the pellet stove back on. Sigh, now we pay for those warm temps of last month. The smoke was more an annoyance and never got that bad in the building. Some of the huge snow piles are still around but I think even those may be gone after this weekend. All of the gardening types are getting excited about finally being able to dig in the dirt again. There in a nutshell is the modern drawback of the hack. However camping in 80 degrees. I want to see pictures of Alaska's state bird. I've heard the mosquitoes are monstrous. I'll see if I can get a good photo of the giant mosquitos this weekend. I'm not sure what the ground looks like in the campground but hopefully it isn't too damp.